We tend to be pretty big fans of the independent development company Frogwares here at Diehard GameFAN. 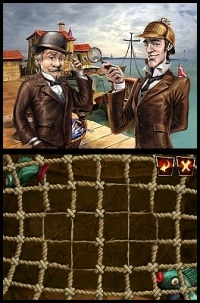 They make some fun and out of the box adventure games, most of which are based on the adventures of Sherlock Holmes. We’ve seen the good detective take on a cult of Cthulhu worshipers, Arsene Lupin and even Jack the Ripper thanks to Frogwares. Recently, they’ve been taking the detective out of straight point and click adventure games and putting him into more puzzle based adventure games. First came Sherlock Holmes and the Hound of the Baskervilles for PC, and now they’ve released Mystery of Osborne House which is more like a Professor Layton style game than their usual work. 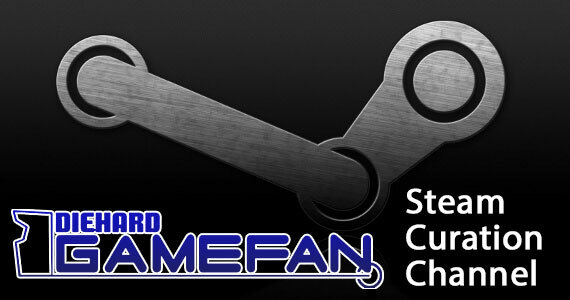 Even though I’ve never reviewed one of Frogwares’ Sherlock Holmes games here for the site (I have reviewed their cracktastic Dracula: Origin though), I’ve played through most of them and had fun with them. As such, I decided to order this game (Since THQ wasn’t giving out review copies) in hopes that this would start off a new year of gaming goodness off right. Sherlock Holmes and the Mystery of Obsorne House is definitely geared for a younger audience than Frogwares’ usual titles. Characters (aside from ones that Arthur Conan Doyle actually wrote) are given names that are either hints or puns. At the same time, the game actually ties all of Frogwares’ previous titles (which are pretty mature at times) together, continuity wise, and has allusions to them all. It’s kind of an odd duck in this regard. It’s close to Christmas Day in 1888. Holmes is bored (and probably out of laudanum and cocaine). Watson tries to convince him to take a case, but all the ones he rattles off bores Holmes even further. Finally, an invitation to renowned puzzle inventor Dr. Brainstorming gets Holmes in motion. He and Watson visit the professor and solve two puzzles in what amounts to a tutorial for the game’s flow. When they get home, they solve Brainstorming’s third and final puzzle, which turns out to be an invite to solve a case that includes several murders, attempted assassinations of Queen Victoria and the Prime Minister (who is never named but would be Robert Cecil, Marquess of Salisbury, for you history buffs) and even a cout d’etat attempt on the entire government of the United Kingdom. Pretty intense, no? The game is pretty short. It only took me two and a half hours to complete the game with a perfect score, but the plot is very well done, with every bit of dialogue having relevance instead of padding. As well, every one of the thirty nine puzzles (not counting the four post game bonus puzzles) in the game actually are story related and keep pushing the plot forward instead of the ones you find in Professor Layton games which are just things that are thrown in (a huge pet peeve of nearly every adventure gamer). As such, I found myself enjoying this game far more than Level 5’s franchise, but also wishing the game was longer and had more puzzles (it has less than half of those in a Layton game for example). The story might not have the usual depth or drama that Frogwares’ PC titles featuring Holmes contain, but the quality is still here in this truncated form. 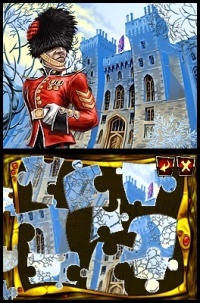 Like a lot of adventure games, especially those for the DS, Osborne House mainly features static visuals. There is only a single character portrait for each character (except for Holmes himself, who has three), so you really have to rely on written dialogue for any emotion or tone, especially since there is no voice acting. 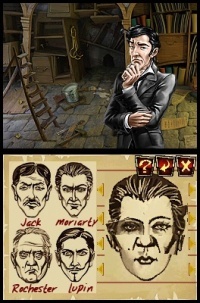 Considering the cost of the DS game is two to three times that of the average adventure game for the PC, Frogwares could have easily put a little more into your visual options for the characters, but at least the character portraits that ARE here are nicely done and have a lot of detail to them. Background graphics are static as well unless you find an item you can use, or conversely, when you use an item from your inventory on something that can be manipulated. Then you get a SLIGHT change, but that’s it. Again, if you’re looking for animation or even the slightest hint of movement in your visuals here, you’re going to be disappointed, but the backgrounds are very well rendered and nice to look at. Finally there are the puzzles. 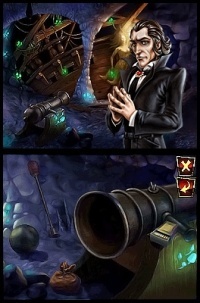 This is the only part of the game that has any sort of animation, which can range from sliding blocks into place to form a picture or tapping an ever moving cannon to ensure it shoots its load at the correct target. Conversely, these puzzles have the animation the rest of the game lacks, but the graphical quality isn’t as good. Of course it doesn’t need to be since they’re puzzles, but it’s still an interesting contrast between the adventure and the puzzle parts of the games. As mentioned previously, there isn’t any voice acting in this game, which is a shame as Frogware games are usually packed with it. I’m not sure if it’s a publisher decision or a cost decision due to producing for the DS instead of the PC, but it’s still a minor letdown. 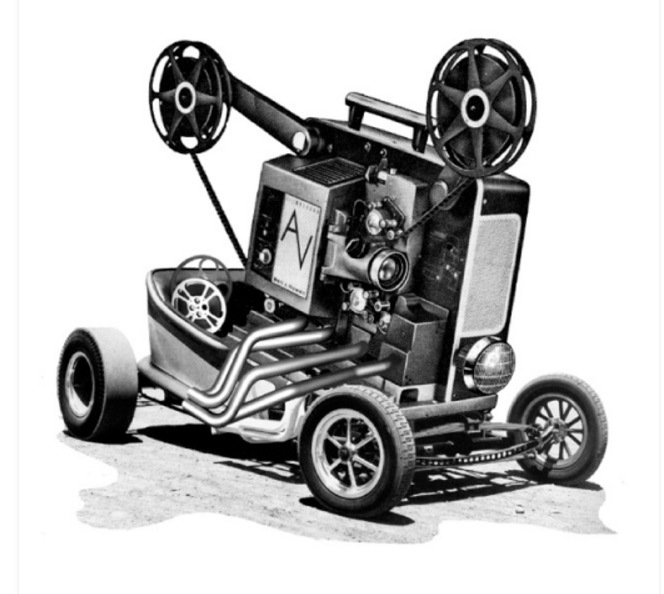 As such, all we can talk about are the sound tracks and the sound effects. Unfortunately, there’s very little of either. There are only a few scant musical tracks throughout the game, and you’ll hear them over and over again. Of course, as the game is only two and a half hours long, the music doesn’t stick around long enough to get annoying. Sound effects are pretty much limited to a happy noise when you get a puzzle correct or when you find an object you can add to your inventory. There are a few other sound effects in the puzzle, but Osborne House really does give you the bare minimum when it comes to involving your auditory senses. Again, this was disappointing, especially since I’ve played other Frogwares titles and I know how good they can be, but it is what it is. What’s here is acceptable but there is definitely room for improvement. This is actually a pretty hard category to judge for this game, as the thirty nine puzzles are pretty diverse in how you play through them. However, all involve using the touch screen, and everything is pretty easy to activate or manipulate via your stylus ONCE you know what you’re supposed to do. You see, for all thirty nine puzzles, there is one common thread uniting them – you are never given any instructions or goals. You’re just given a puzzle and let loose to sink or swim. Now, I personally enjoyed this, but this will no doubt frustrate quite a few gamers, especially younger ones. Solving a puzzle nets you points, and there are four bonus puzzles that you can unlock once you hit four different scoring thresholds. If you beat a puzzle without a hint, you get a perfect score. If you use a hint, your score is reduced based on which type of hint you use, be it a small hint or a big hint. Now I beat the game with a perfect score and only tried the hints after I beat the game so I could see what they do for the purposes of this review, and I can honestly say unless you are brand new to puzzle or adventure games, you shouldn’t bother. A small hint is a very veiled hint that means practically nothing. 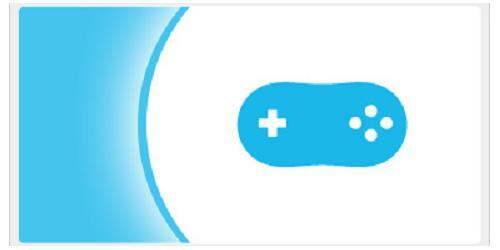 A big hint is simply the instructions for how you play the game. Both are pretty worthless in this regard. The only puzzle that you might need instructions for after a minute or two of fooling around with a puzzle is the last one in the game, and all you need to do there is move the green blocks on top of the fuse. Don’t think of that as a spoiler, as it’s easier said than done. So it’s a bit annoying that there aren’t any instructions for each puzzle, but you should be able to figure them out easily. It’s MORE annoying that the “hints” aren’t actually hints at all, nor are they helpful. The adventure parts of the game are standard to point and click gaming. You have an inventory. You add items to your inventory where you can either combine them to form a new item, or use an existing item on the screen to achieve a specific effect. It’s all very well done, but since Frogwares has been doing this for nigh on a decade, I’d expect nothing less. Finally, there are the three quizzes that occur in the first half of the game. These are meant to test your deductive and inductive reasoning. Basically you’ll have three theories put before you and a set of clues that you’ve discovered. You have to pick the right theory and all the correct clues that support said theory. You have to get every last bit correct to move on, and for some people, this will inevitably become a tedious guess and check operation. These are probably the hardest puzzles in the game, if only because the logic behind which clues are valid and which ones are not are definitely off. Overall, Osborne House is an enjoyable, albeit short, experience. The lack of any actual help towards the puzzles will no doubt grate on the nerves of younger gamers or those that are either used to a hint system that is useful or are new to puzzle gaming. Longtime puzzle fans might actually appreciate the extra challenge though. Really, it all depends on if you like a safety net or not. Like I said, I beat the game with a perfect score my first time through, so you should be able to get through it with a decent amount of effort. The game is only two and a half hours long. It’s exceptionally linear. The solutions to the puzzles never change and the plot is static. Really, there are only two reasons to replay the game, and both are exceptionally flimsy ones at best. The first is to improve your high score so you can unlock all four bonus puzzles, and the second is to play said bonus puzzles… which can be beaten in about ten to fifteen minutes total. Now, granted, adventure games are usually one and done games, and this is no exception, but they also tend to be far cheaper than Osborne House and they certainly last a lot longer. Really bad show by THQ to sell a much shorter adventure game than the standard for far more than the typical MSRP. Sherlock Holmes and the Mystery of Osborne House is one of those games that gamers will find either very easy or very hard depending on the amount of hand holding they need. The adventure parts of the game should be easy for any gamer, as the flow is obvious and the game actually pushes you to the correct choices constantly. The puzzles, however, are very diverse. You might have to put a puzzle together, assemble the correct face of a suspect, shoot a cannon, make sure a series of threads do not overlap with each other, and various other things. There are only thirty nine puzzles in the main game, but there’s never an overlap save for the quizzes. Now, I didn’t have any trouble with the puzzles, and you can always reset your progress and start the puzzle over without any points being deducted, but if you need clear instructions and/or a goal, you might have a problem with your progression through the game. I enjoyed both the diversity and the complexity of the game, but as I’ve encountered nearly all of the puzzles in other (better) adventure games before, coupled with the fact the game was so short, I have to say the game was fun for what it is, but there was definitely room for improvement, as well as challenge. 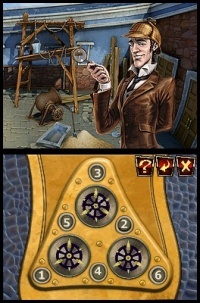 There are countless Sherlock Holmes games out there. 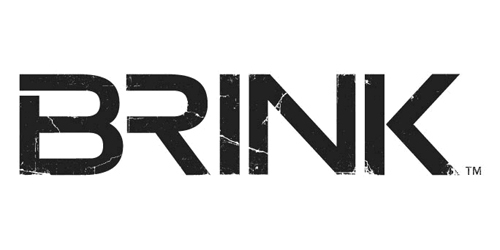 Frogwares themselves have made half a dozen – all adventure games. Now I could give them credit for making this one a puzzle adventure game, except that it’s too short, too similar to the Professor Layton titles, and almost all of the puzzles are ones other games have done before. There’s nothing really here that makes the game stand out at all. 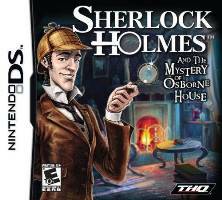 Sure it’s fun, but you could easily go out and buy Sherlock Holmes and the Mystery of the Mummy for the DS. It’s another Frogwares game, it’s a pure adventure rather than a puzzle adventure, it’s much longer and it’s only ten dollars. Why WOULDN’T you go that route? As harsh as I’ve been to this game at times, I can’t deny I beat the game in a single playthrough. I like Frogwares’ titles and I like Sherlock Holmes, so it’s no surprise I was glued to the game from beginning to end. Of course, the game’s length was about that of a movie, so that last statement is skewed in favor of the game, but it does remain true. I really enjoyed this game even if I was disappointed with the overall package, the length, and the cost. This is one of those odd things for me. On paper, the DS, like the Wii, should be a haven for adventure gaming. Both can handle the point and click style of the genre and it should have been a rebirth for adventure gaming instead of it being an all but PC exclusive affair these days. Granted, some games have successfully made the leap, like the Sam & Max series, and even titles like Grey Matter or the Secret Files games have had a successful showing on next gen consoles. However, the DS still remains a system that is built for the adventure genre, yet does everything wrong. The Mystery of Osborne House is a perfect example of that. It’s exceptionally short, and in an era where adventure games for the PC are between $2.99 and 19.99 on the average (and about ten hours in length), you have this two and a half hour game for thirty bucks. Who is really going to make the switch for something like that? The same holds true for other DS adventure games like Hidden Mysteries: Vampire Secrets. I could have paid 19.99 for the DS version… or $2.99 for the PC version. Why would anyone go for the former? For some reason the DS is pricing itself way outside of a genre that could be a boom for developers, publishers and Nintendo alike. I don’t know if it’s greed or stupidity, but it’s unfortunate to see. As fun as the game can be, the length and price put it far outside what most adventure gamers would be willing to put up with, especially when they tend to be PC exclusive gamers. Sorry Frogwares. So on one hand, Frogwares has made another fun Sherlock Holmes title, and have even used this DS case to put all of their PC games into some sort of continuity. However, they’ve also made their shortest and most expensive game to date, and that one-two punch is sure to push away even their hardiest fans because of it. 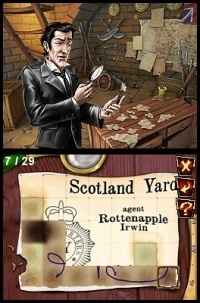 Again, if you haven’t played a Frogwares title and you’re interested in seeing what they have to offer, or you just really want to play a Sherlock Holmes themed game and you don’t like playing on a PC, I suggest picking up Sherlock Holmes and the Mystery of the Mummy for the DS. It’s much cheaper, it’s the same team and it’s a far better game. I’m happy to see both Frogwares and THQ have given us a DS exclusive adventure game, but a the end of the day, I can only give this title a thumb’s in the middle due to multiple issues. Although I enjoyed Sherlock Holmes and the Mystery of Osborne House for what it was, it’s just too short and too expensive compared to other adventure games to fully recommend. It has a fun story and a decent variety of puzzles and I actually preferred it to the Professor Layton games, but thirty dollars for a two and a half hour game in a genre that is usually ten hours long for twenty dollars (or less!) rubs me the wrong way. SH&tMoOH is fun for what it is, but it’s also the most expensive and least enjoyable of Frogwares titles. As such, I suggest you look elsewhere until there is a massive price drop.